Here is the desirable ORIGINAL one sheet from the 1966 movie based on the immensely popular 60's TV series. I think the movie lead to the series. Excellent condition and has been professionally linen backed. One of my personal favorites!! A real beauty, even more so in person!! 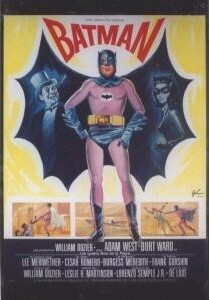 1966 - Original French release poster for "Batman" the movie. Very rare and stunning artwork !! 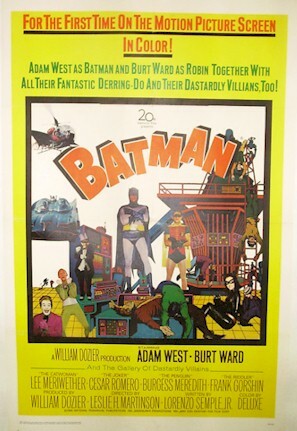 19x23"
1966 - Considered by many to be the most stunning and best artwork of all Batman movie posters is the 47x63 French release from 1966. 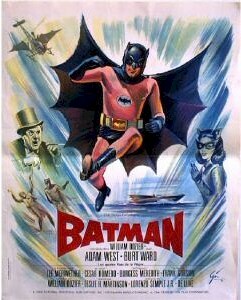 With a full close-up body shot of Adam West and Penguin and Catwoman within his cape wings! It is just a beauty and one we have always wanted to acquire! Excellent ++ condition. 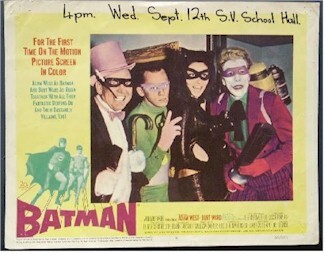 ORIGINAL One sheet from the 1954 series. This is a re-release from 1966 to take advantage of the incredibly popular TV series. Good condition with some minor pieces missing, but could be easily touched up with linen backing. Very RARE! This is the ONLY one we have seen. 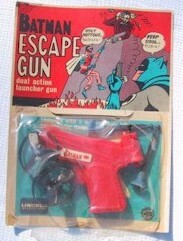 Super Rare 1966, Adam West , Batman era, Batman Escape Gun,Red Variations, Robins Gun, Dual Action Launcher Gun, Both actions work perfect, I could not resist testing them....Lincoln International.made in New Zealand complete with Original card and accessories...The card is complete, un-punched, but the bubble has come away, and the item can be removed,The gun is in mint condition, view photo,s I found an old stock bag with 2 or 3 left in it all the cards are the same or worse, Lincoln International, sent all there stock boxes in paper bags,Each Gun comes with 2 plastic Darts and 2 Flying Gadgets,They are complete as well. 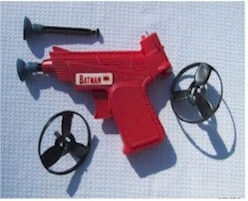 What can I say a great Find,... "Robin's" gun is Red and complete with Batman Sticker on the side, They are around 4 inches long and are made out of plastic. Excellent condition,...The Artwork on the card is Excellent as well. 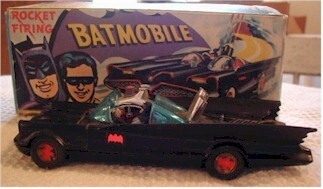 1966 - Original Batman Corgi Batmobile. 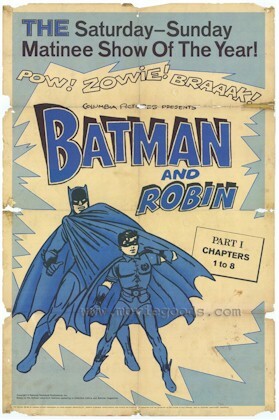 Both Batman and Robin are in the seats. Original red decal and red Bat tire version. Very good condition. Original box, has one flap missing. NEW!! 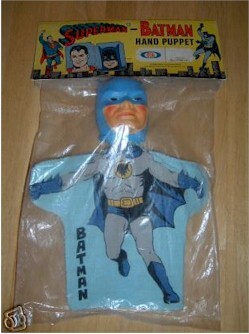 1966 - Original UNOPENED "Batman"
puppet!! Very RARE to find in original, unopened condition!! 1966 - Nice original lobby card. Has been beautifully framed and matted. 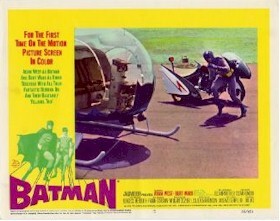 1966 - Nice original lobby card from the 1966 movie "Batman". 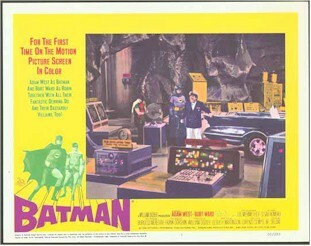 Features B&R along with the "Penguin" in the Batcave..
1966 - The best card of the eight card set. Great close-up of both Batman and Robin. NICE!! Very good condition with staple holes and a small chip on right border only. 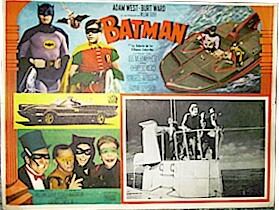 1966 - Original lobby card. 1966 - The rare "boat scene". Some ball point pen writing on top right, can be easily removed. 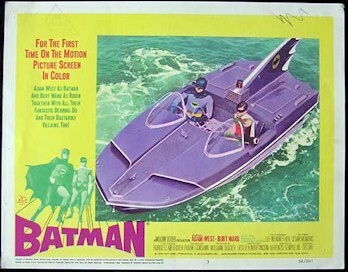 A great shot of the Duo in the "Bat Boat. 1966 - HERE IT IS!! 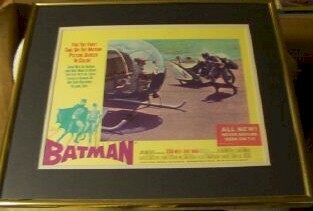 What many Batmaniacs consider the gem of the lobby card set!! The four villains together for the first and ONLY time!! 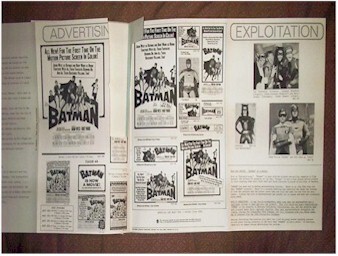 Some writing at top to advertise the 1966 showing. Otherwise a BEAUTY!!! 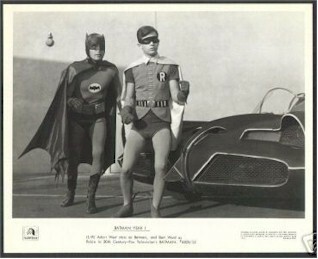 1966 - Original Mexican lobby card from the 1966 release of "Batman". The artwork and graphics are beautiful! Even better then the US version!! Larger then the standard 11x14 US lobby cards. These are about 13x16. These very rarely surface on the market. 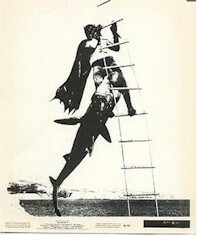 1966 - Rare original photo still from the 1966 "Batman the Movie". 1966 - An original still from one of their TV episodes. 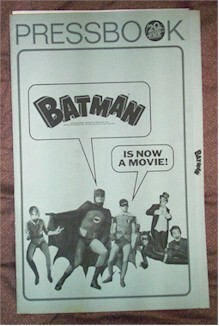 1966 - Very rare original Pressbook for "Batman" the movie. Has great write-ups of the characters and all the movie poster displays for theatre owners to purchase. Great item for the Bat lover! !